How committed are you towards your financial goals? 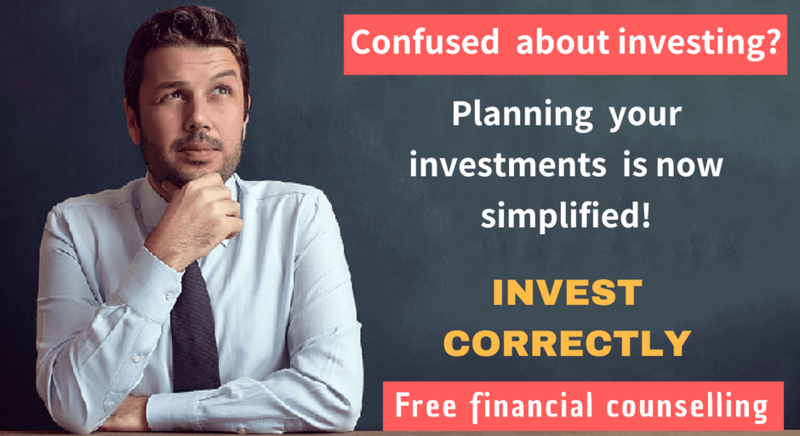 Can you and I achieve anything in personal finance without having a true commitment towards the financial plan and goals? How commitment works in achieving your financial goals? 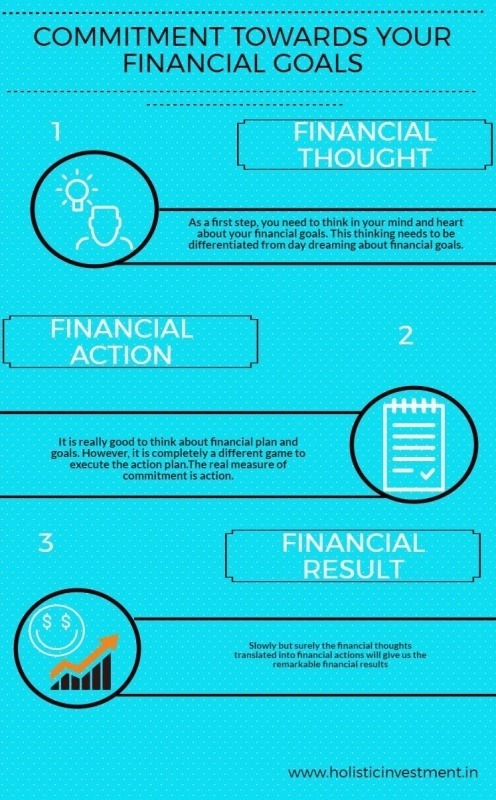 As a first step, you need to think in your mind and heart about your financial goals. This thinking needs to be differentiated from day dreaming about financial goals. Think in detail to get more clarity about your financial goals. Get into the specifics. This clarity and specifics will strengthen your commitment towards financial goals. Instead of just vaguely dreaming about retirement, can we go one step deeper and answer the specifics. What is the regular monthly income required after retirement? How are you going to source this monthly income after your retirement? How are you going to take care of the inflation? How are you going to take care of health care expense after retirement? Can you write the answers for the above questions in a paper? Can you discuss the same with your family to check it? Also can you make a call to your financial planner or advisor to discuss the same? It is really good to think about financial plan and goals. However, it is completely a different game to execute the action plan. The real measure of commitment is action. Thinking is mental and doing is physical. Do you want to succeed in the mental world or do you want to succeed in the physical/real world? The action plan for your retirement plan may be to start an SIP and also to go for a health insurance cover. There may be some challenges with the paperwork. You may need to go for a health check up to get the health insurance. A great financial plan without proper periodical execution is a financial hallucination. Stop wishing, there are enough role-models in your circle to guide you in taking right financial and investment decisions and become one of the role-model. Executing a financial plan may be tedious and time-consuming. If you are committed towards your financial plan and goals, then these things will be your priority. If your commitment is less, then you may start procrastinating. The opposite of heroic action is inaction and procrastination. Financial procrastination is delaying some financial action item that you know should be done now. You are going to be left behind.Just remember, whenever you postpone a financial action item, you don’t have enough commitment towards your financial goals. No financial plan works unless you are willing to do the work. Now is your moment to implement the financial plan. Prioritise and complete just 3 action items to complete this week. Commit and complete just those 3 items without postponing. Feel and experience the momentum and commitment towards financial plan and goals have gone up. Slowly but surely the financial thoughts translated into financial actions will give us the remarkable financial results. List down the financial results you have achieved. What kind of commitment helped you achieve those financial results? List down the financial results /goals you want to achieve. What level of commitment will help you achieve the financial goals? Which type of personality are you? (w.r.t. your commitment towards financial plan and goals)There are 4 different types of personalities we can categorise, with reference to the commitment they have towards their financial plan and goals. People belong to this category don’t have serious goals and also they don’t take their financial future seriously. They predominantly lack motivation. They will have care-free attitude towards everything. This type of people don’t commit because they have no financial goals. This second category people are afraid of not achieving their financial goals. All these are perceived as pain by this category and they are afraid to go through the pain. So they don’t commit to their financial goals. This category need to stop being afraid of what could go wrong with their financial plan and FOCUS on what could go right. This category needs to install the right mindsets and heartsets to achieve the financial goals. This category will commit at the planning stage (thinking stage). When they need to do the action part, they commitment will slowly get diluted and they quit in the midway. Few investors enthusiastically enrol for financial planning, but will take more time to fill up the fact finder file. But Endurance in implementing the financial plan is RARE.Few investors after getting the financial plan, they will find it difficult to execute and start postponing the implementation. Your financial success is determined by what financial actions you take today; not by what you plan to do tomorrow. If you have a lot of pending financial actions, may be you have unconsciously chosen to quit on your financial plan and goals. This category of people, regardless of all the odds they face in their personal life and financial world, will not only commit to complete all the action items listed in the financial plan but also commit to achieve all the financial goals. Which type of personality you belong to? The answer will reveal your commitment level towards financial plan and goals. Then work on increasing your commitment towards financial plan and financial goals. It will pave a sure way to your financial success. Which type of personality do you belong to?What are your views on these? Kindly share it in the comment box. Genuine Article. Shows the experience. I have no specific goal or financial plan. I save about 90 % of my earnings. At present the only big cost item left for me is the marriage of my younger daughter. I have already bought the gold needed for her and have a fair idea about the other expenses. I will work for at least two more years. I have enough savings and investments to generate earnings equal to 90 % of my present earnings. I plan to spend only a small part of the yearly earnings and keep the balance invested so that it grows. From reading some articles, i have learnt that if I spend only 3 to 4 % of my nest egg per year, it will be safe to meet the future cost of living. The investments are showing a yearly growth of about 15 %. I own my house, have no debt and also have a few plots of land which can be sold with very good profit if needed. At one location, I have built a farm house. You are Truly a man of commitment! Next Next post: 99% of investors are not with the right Investment Planners. What about you?